Dr. Mohammad Iqbal, District Health Officer: There is definitely a negative health effect of tobacco. There are cases of lung disease been reported in Ladakh but there is no such comprehensive research done to claim that the cause of the disease is only due to cigarette smoking and about its impacts on health. There are other factors which cause the disease such as a dust storm, the presence of silicosis, exposures to the smoky firewood in winters etc. Dr. Tsering Nurboo, Physician did a study on lung disease which shows more about the Chronic Obstructive Pulmonary Disease (COPD) and silicosis. Back in the 70s smoking cigarette was very common in Ladakh. There are some villages where tobacco was cultivated but later it stopped with the availability of readymade products. That was a time when many people were not aware of the negative effects of tobacco consumption. In the year 2016, National Tobacco Control Programme (NTCP) was introduced in the state of Jammu and Kashmir. The objective of it was to create awareness and control tobacco consumption, production and sale. For the policy formulation, planning, implementation, monitoring and evaluation of the different activities under NTCP, there are National Tobacco Control Cell (NTCC), State Tobacco Control Cell (STCC) and District Tobacco Control Cell (DTCC). The Tobacco Cessation Centers are functional in SNM hospital, Leh. People who are willing to quit the habit or the one who is needed as referred by the physician are counseled and treated. The counselor helps the addicted person understands the various ill effects of tobacco consumption and motivates him/her to quit. Many a time, counseling only helps when the person is willing to quit the habit. On the other hand, people who are unable to quit are given Nicotine Replacement Therapy. In this product with low doses of nicotine such as gum, patches, inhalers and spray are used. The therapy is to cut down on the cravings for nicotine and ease the symptoms of nicotine withdrawal. It has to make sure that one should not smoke because doing so the nicotine level will increase. The therapy along with the counseling session is carried out to help the person to quit tobacco use. Also, there are medicines available for the one who is unable to quit after the counseling and therapy. In the year 2017, a total of 446 people were counseled and out of which 28 people (both locals and non-locals) have quit smoking. This year, till now around 29 people are under medication. Apart from this, District Tobacco Control Cell has recently appointed a consultant who carries out outreach programs. Under this, we conduct various activities and awareness campaign mainly in schools. In the year 2017-18, we have carried out awareness drive in 64 schools. And if we talk about the enforcement of the Act to monitor any violation of the provisions of COTPA, this needs to be carried out in teams. We do carry out law enforcement drive and issue challan against the violators who smoke in public places, displays or sell the tobacco items openly or sell it to the minors. A total of 16 drives have been carried out and around 250 people were fined. One of the challenges faced is that we can’t keep an eye on every shop selling tobacco products and seize the products directly. We also organised an awareness programme for all the shopkeepers and stakeholders about the COTPA Act. Also, the hoardings and posters are displayed at the main market, bus stand, schools, offices and other public places. Every year, we carry out a survey to update the medical report of the district which mainly emphasize on the mother and child health but this year we have requested the concerned individuals to enlist the tobacco consumers. 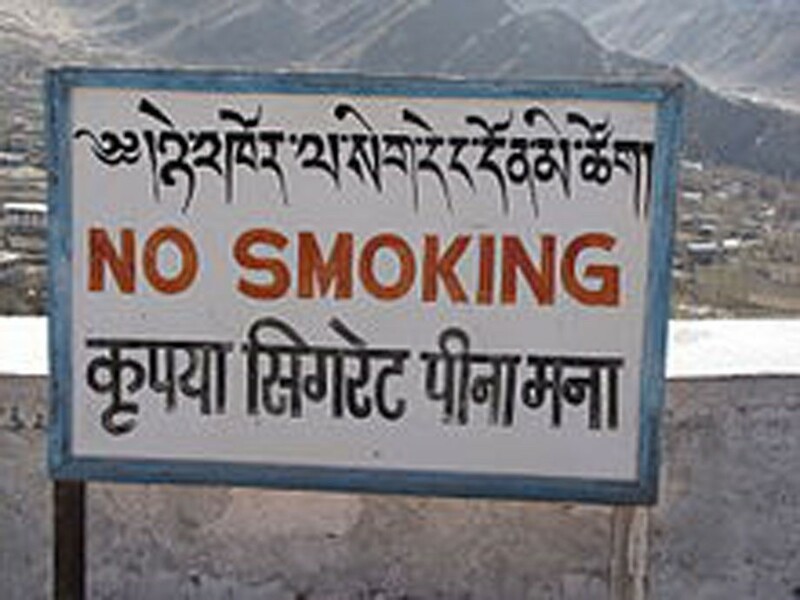 Hopefully, that will help us get an idea about the number of smokers in Leh town. There is a need to study the cause of the disease such as lung cancer in Ladakh because there is a possibility of both active and passive smoking effects. Many school-going kids in Leh are consuming a tobacco product named ‘Cool Lip’. Under our Tobacco control program, we are going to work on this also. To ban tobacco completely in the district needs a collective effort and also a strict action against the violators. The cost of tobacco products should be high; this will somehow discourage people from buying these harmful products. Awareness at all levels needs to be carried out. A collaborative effort of every stakeholders and society as a whole to mitigate the issue. Dechen Wangmo, Principal, Siddhartha High School: The prevalence of tobacco use in our society cannot be classified that the habit is among the adult or the youth particularly. Since I am more in touch with the students, I have noticed that there is rampant use of smokeless tobacco named as ‘Cool Lip’ among the school-going children. It is addictive and the habit is observed among the students of class 5th and above. I noticed that there is social and physical environment attribute which promote tobacco use among the youth. Firstly, easy access to tobacco products. Tobacco items are easily sold and purchased, there is no regular monitoring and action. I have caught a shopkeeper in Leh red handedly selling the product ‘Cool lip’ to the school going minors. There were no interventions when a child in a school uniform asked for the product and the shopkeeper sold it with no issue. Secondly, there is a strong relationship between tobacco use and depression, anxiety or stress. We have felt that most of the time parents or teachers compare the child with his / her academic performance, habits and many more. All such criticisms and scolding every time makes them depressed and they end up smoking and chewing tobacco to cope with these pressures and stress and with an expectation of positive outcomes. Thirdly, the curiosity to taste it, peer pressure and parental smoking turn into habit later on. And last, lack of support or involvement from parents and the family issues are also a reason. In today’s time, there is a communication gap among the families. There is a need for regular conversation and time for the kids to get them on the track. There are children who are afflicted and are struggling to quit tobacco use. Tobacco use is started during early teen and this age group requires constant monitoring and timely appropriate action to curtail usage. Under Section 6 (a) of the Cigarettes and other tobacco products Act (COTPA), 2003, selling of cigarette and other tobacco products to a person below 18 years is prohibited. But, I have noticed that it is accessible. To find out, I have asked a schoolboy to get the product cool lip from the shop. The child in a school uniform went and asked the shopkeeper and surprisingly the person without even asking anything easily provided the product. I have caught the shopkeeper red handedly and the complaint reached to the police where the officer blames the parents and teachers also. There has to be a strict check and balance to prevent violations of the minimum age requirements for the sale of tobacco products. Also, a counselor is needed in every school for social-emotional learning. The most crucial part is to understand the issue and work collectively to curb the issue. But we always end up with the blame game. Counseling needs to carried out at all levels in the society, it shouldn’t be only limited to the youths or the students. Positive change can be brought if each of us realizes and have strong willpower to mitigate bad habits. Strict law and action are needed against the violators. Communication between the child and parents needs to be strong.